One of our nation’s most esteemed schools, Yale University is a private research university founded in 1701, the third-oldest institution in the Unite States. Yale is conveniently located halfway between NYC and Boston in the heart of New Haven, Connecticut. About 4,500 undergraduates call the 345-acre campus home. 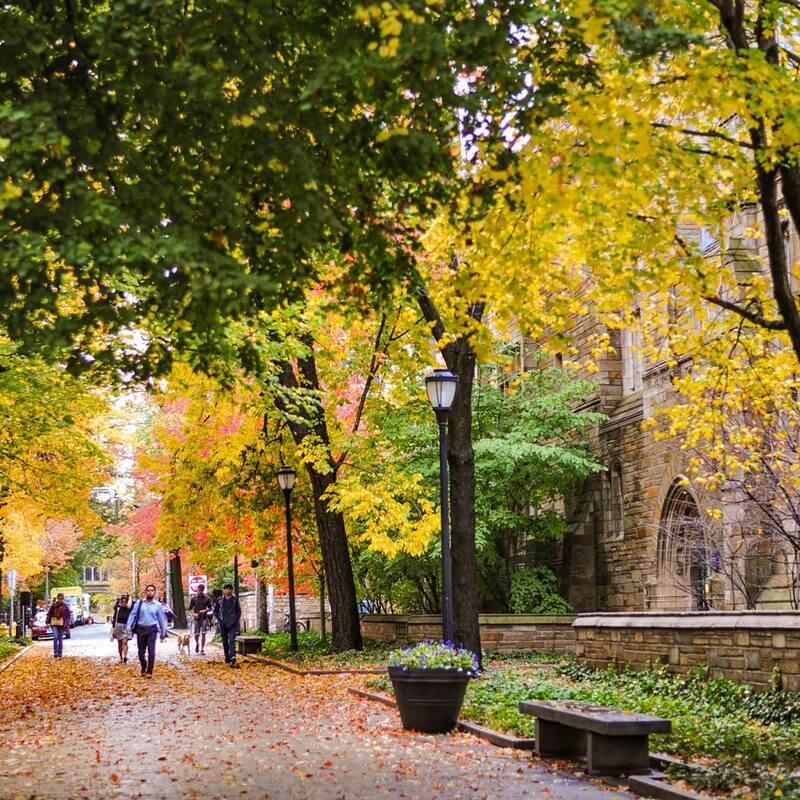 Though an urban school, Yale is known for its beautiful campus, a mix of scenic quads and historic buildings displaying both New England charm and urbane city energy. Yale boasts a dynamic and diverse student population, fitting of its Ivy League status. Transportation: Union Station is minutes from the Yale campus. Metro-North offers frequent train service between New Haven and New York City. Amtrak provides train service to New Haven from Vermont, Providence, and Boston to the north, and from Washington, D.C., to the south. Union Station is also a Greyhound and Peter Pan bus terminal. Traveling by plane? Nearby airports include Bradley International Airport (BDL) in Windsor Locks, CT (53 miles), LaGuardia International Airport (LGA) in New York City (72 miles), Kennedy International Airport (JFK) in New York City (80 miles), and Newark International Airport (EWR) in Newark, NJ (92 miles). Stay:: Less than a block away from campus; our first choice is The Study on Chapel Street, a sleek, contemporary boutique hotel with a 24-hour lobby café and an onsite restaurant Heirloom, perfect for breakfast before your tour. Many families stay at The Omni; a good option just steps from the Yale campus. The Courtyard by Marriott is adjacent to campus, right by the Shops at Yale on Broadway, which includes the Yale Bookstore, an Apple store and other boutiques and restaurants. Coffee:Head to Willoughby's Coffee and Tea or Blue State Coffee for your morning caffeine boost. Both places double as study spots for many students who want a workspace other than the library, so chances are you’ll see some Yalies in action. Wandering the campus, we asked a student for her recommendations. She steered us to Koffee, stating that though it’s a bit further from school it has the best brews in New Haven. (It’s just a short drive on one edge of campus, close to the Peabody Museum.) We loved the quirky décor, and it was packed with students diligently working on their laptops, undoubtedly encouraged by all the charging stations. Breakfast: Maison Mathis, is a chic, airy Belgian café right across from the Yale Bookstore. Belgian waffles and fresh pressed juices switch over to soups and salads later in the day. Students swear by the low key breakfast at The Pantry (expect a line on the weekends, a short drive from campus over by State Street. Lunch: New Haven is world famous for its old-school pizza joints, inciting pizza lovers to make a pilgrimage to New Haven just to sample the epic signature charred crusts at one of the big guns: Sally’s Apizza, Frank Pepe, and Modern Apizza. Pepe’s is arguably the most famous, the first to open back in 1925 and the inventor of the now legendary white clam pizza. All three are a short ten-minute drive from Yale. BAR a student go-to, is right on Crown Street, just two blocks from campus. The industrial space is fun with a pool table, and a hipster, industrial vibe. There are many pizza options, but Bar’s mashed potato pizza with bacon is the one to order. Yes, mashed potato on a pizza—trust us, you will dream about it! For an alternative to pizza, Claire's Corner Copia on Chapel Street is a student favorite for a quick meal. Order at the counter from a wide range of options including tons of vegetarian and vegan dishes. Leave room for their famous Lithuanian coffee cake. Bookworms will be happy eating soups, salads, and sandwiches amongst the books at Atticus Bookstore/Cafe, also on Chapel Street directly across from the university. Casual: Famous for its “Forbidden Rice,” dine at Sushi on Chapel. Miya’s creative twists on traditional sushi and sashimi and use of unexpected ingredients have people talking. More than 300 varieties of tequila, excellent guacamole, and other Mexican and Southwestern specialties make Geronimo a fun night out. One alum told us she often craves the wings at Box 63 American Bar and Grill. Gourmet burgers and craft beers are the draws at Prime 16. Caseus Fromagerie and Bistro’s menu changes seasonally with a heavy emphasis on cheese from their excellent cheese shop next door. A Step Up: Reserve a table at Union League, a French-inspired bistro directly across from campus in a beautiful historic space. Everything’s local and seasonal at farm to table Heirloom, located within The Study at Yale from chef Carey Savona, a Connecticut native. The menu at Zinc is globally inspired; share a bunch of small plates to start before moving on to the more substantial entrees with an Asian slant. Other popular spots include L’Orcio, Roia and Harvest Wine Bar and Restaurant. One of our most trusted foodie friends turned us on to Atelier Florian, where seafood is the star. Don't miss the stellar bouillabaisse or make a meal ordering from the menu’s small plates. The restaurant is also open at lunch, happy hour and for weekend brunches, plus theres a late night bar menu Thursdays-Sundays. Local Attractions: The Yale Art Gallery, established in 1832 is the oldest university art museum in the U.S. with an outstanding collection including Vincent van Gogh's The Night Café and works by Picasso, Manet, Hopper and Jackson Pollack. Admission is free, so be sure to stop by even if you only have a short window after your tour. After an extensive restoration, the Yale Center for British Art reopened in 2016, housing the most extensive collection of British art outside the UK. Explore more than 4 billion years of biological, geological, and human history at the Peabody Museum of Natural History. Yale is well known for its excellent drama and music programs, enjoy a show at the Tony- award winning Yale Repertory Theatre. Classics and new works are performed in a converted church; check their calendar to see what’s on stage while you’re in town.On Saturday mornings in May through December, head to Wooster Square where City Seed Farmers' Market takes place from 9 am to 1 pm. The market is small, but well represented by artisan surveyors including a Yale farm booth manned by student interns. Yale is a fantastic place with a beautiful campus and great restaurants. There is a never-ending plethora of cool events to check out. But by far my favorite thing about Yale is the people. When you visit, go to a dining hall, hang out on campus, watch a performance, or get a coffee at Blue State while students are studying so you can immerse yourself in the community to get an authentic feel for it. When you visit be sure to get a copy of the Yale Daily News, look at Yale College Calendar online, or talk to a current student to find out what performances (improv shows, dance shows, A Capella concerts, plays, slam poetry readings, etc.) may be going on around campus while you are visiting. Just toured the Yale University Campus? Are you a Yale University student, parent or Alumni? Fill out this 2 minute survey to supplement our Daytripper University Guide for Yale University!